Fible Farms is an established neighborhood in Crestwood, known for beautiful lots and mature trees. Fible Farms subdivision is located off of Highway 393. Prices of homes in Fible Farms range from $250,000 to $490,000. Development of Fible Farms began in the 1970s. Click the map to the left to view each home in Fible Farms. There is a satellite view button in upper right. Fible Farms lots are very spacious. Usually, the lots range from four to twelve acres, making a lot of space for gardens and entertaining. Some of the houses in Fible Farms have ponds or swimming pools on the property as well! The lots are also perfect for those that want space between neighbors but want a home that is in a neighborhood. Fible Farms homes have various styles and floor plans. Some of the styles of homes in Fible Farms are quad level, split level, ranch, Cape Cod, and two-story. Construction types are brick, vinyl, stone, and log. Each home in Fible Farms has its own unique beauty. Homes in Fible Farms have 1,300 to 4,300 above grade square feet. The majority of the homes have basements as well. Two to five full bathrooms and three to six bathrooms are usually what you’ll find in Fible Farms houses. Several of the homes that have sold recently have had modern day updates in the home. Updated kitchens and bathrooms can be found in many of the homes. In Crestwood, you can grocery shop at Kroger and Walmart. Both are within a few miles of Fible Farms. The closest shopping malls are in Louisville. The Paddock Shops is about ten miles away from Fible Farms and is probably the closest shopping center. Also, Downtown La Grange has a few places to shop. There are several antique shops, consignment shops, and bridal stores in Downtown La Grange. There are also many restaurants near Crestwood to try. A few of the favorite restaurants near Crestwood are Red Pepper Deli, Gustavo’s Mexican Grill, Rikishi, Texican’s Barbeque Pit, and A Taste of Thai. 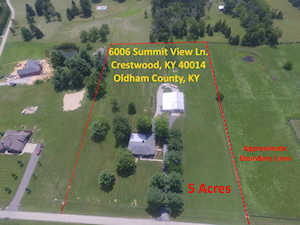 Fible Farms is in the Oldham County School District. Locust Grove Elementary, East Oldham Middle School, and Oldham County High School. East Oldham Middle School is one of the four highest-performing schools in the district. Oldham County High School is one of the four Schools of Distinction in the district. If you would like to learn more or have any questions about any of these Fible Farms houses for sale, or others in the zip code 40014, just click the "Request More Information" button on any property detail page. The Hollinden Team can provide you with past sale information, comparables, disclosures, PVA assessment, and tax information – we would love to answer any real estate questions you have.